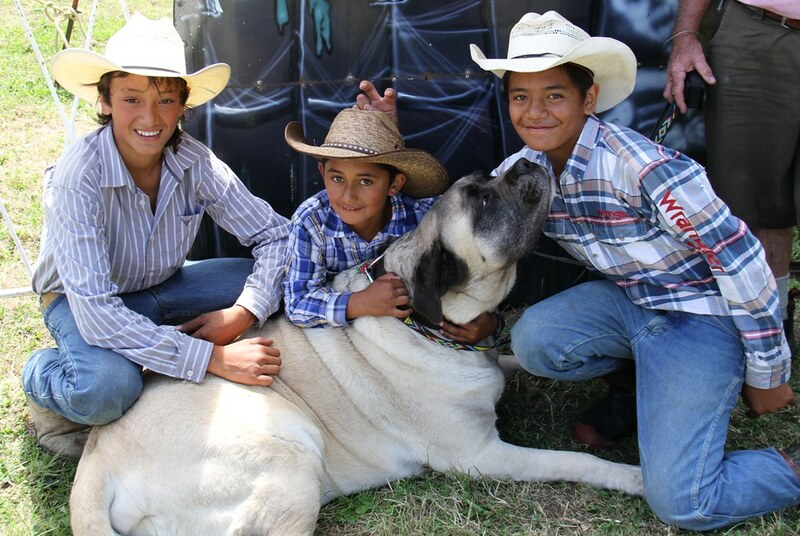 Met these characters at the Wairoa Show - they were young cowboys in the making! The A & P Show is as quintessentially kiwi as it gets. Every agricultural nation have their spin on their community getting together to celebrate what it is they do best, but for us it's the A&P Show. As children we flocked to the show, extorted money off the grandparents and tolerated being dragged around the stock exhibits and home industries so we could then hare off to the amusements to make ourselves sick on rides and lurid coloured drinks. Now as a parent I can attest, not much has changed, but what has changed is our appreciation of what goes on at the Show, what is celebrated and also participating myself in those elements I couldn't give much time for before. A&P Show's celebrate all the elements and primary industries that are vital to our local communities. The hardest thing about hosting such an event is that juggle between tradition and relevance. 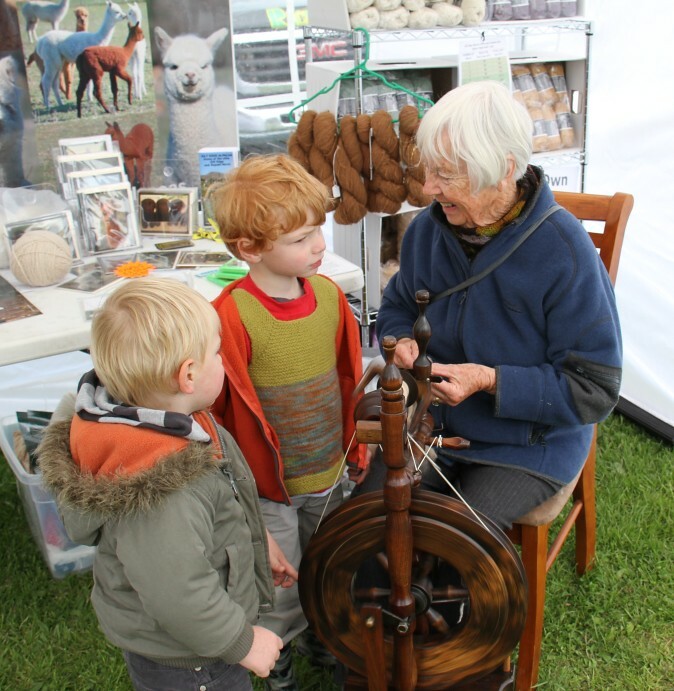 About making the event something that celebrates the generations who have been before, but also speak to the generations and future generations attending now. I see this working in an industry which is hundreds of years old and have loved seeing the refreshed interest in all things home, craft and most importantly hand made. Driven by social media and the ability to easily share what you do to a wider audience. As someone who has always participated in the domestic arts, it's really nice to be able to come out from the shadows and share my knowledge to a wider audience on social media. The Home Industries section at the A&P Show has been one of those few places where we can physically display what it is we do. It's where you can see all the wonderful things created in 'real life' and not on a screen. Our Boy's are Show veterans, this is them years ago checking out an Alpaca exhibit. 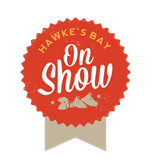 So this year I am so thrilled to be appointed the new section head of the Hawkes Bay HandMADE section - encompassing our local craftspeople and domestic artisans. This year our goal is to encourage all this cleaver people who are creating sharing such beautiful work online to enter and display their work at the Show. Taking the workmanship from behind the LCD screen to larger than life, full HD colour and you could get rewarded for your efforts. 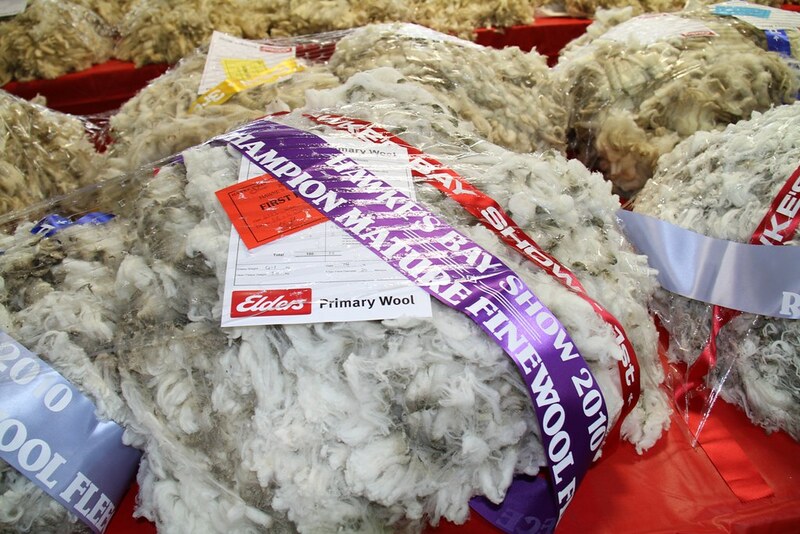 Entering is so easy and you also get free entry and car parking to come and attend the show. Have a look at the revamped schedule of classes HERE and downloaded your entry form HERE and give it a go! I find that the compulsion to start an new project comes from one of three reasons: an occasion, a stunning pattern or luscious yarn. New babies are the best reason to get the needles working away and is still the number reason someone will get started again after a break from the needles or hooks. 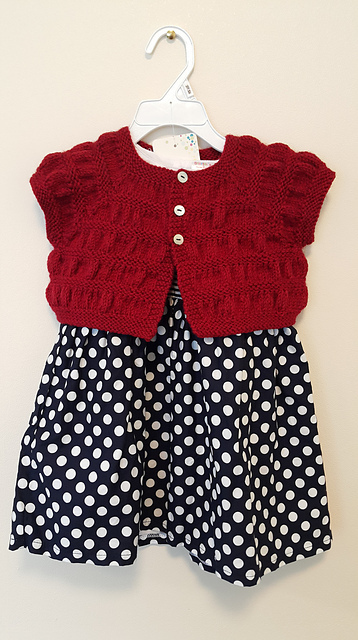 Also knit design has come ahead in leaps and bound in recent years, with patterns vastly more accessible and fashionable and that goes without saying all those beautiful yarns which you can get in every glorious colour, texture and thickness. 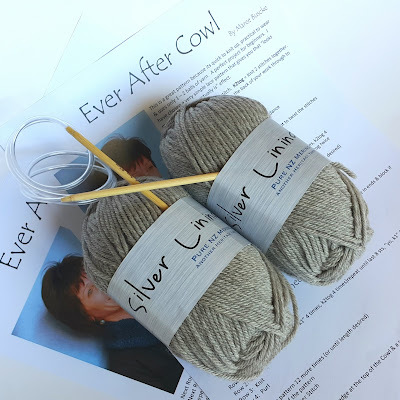 Silver Lining is incredibly soft and perfect for projects next to the skin. So how do you select the right yarn for the job? Tip One - Swap 'Like for Like'. Look at the yarns suggested in the pattern. If you choose, or are unable, to use the yarn suggested then look for a yarn that is similar. Compare the fibre content, texture, construction and length to find a good alternative. So if your pattern calls for a smooth DK wool yarn, look for other smooth DK wool yarns. Tip Two - Natures Best. 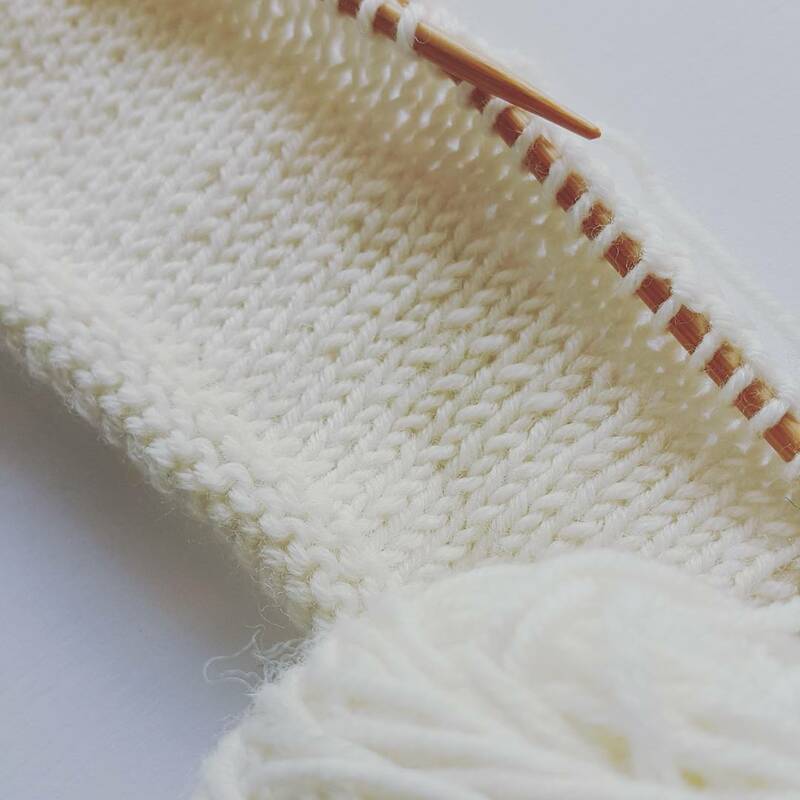 If you are knitting a garment for a baby - natural fibres are always the best option, wool is perfect for babies. 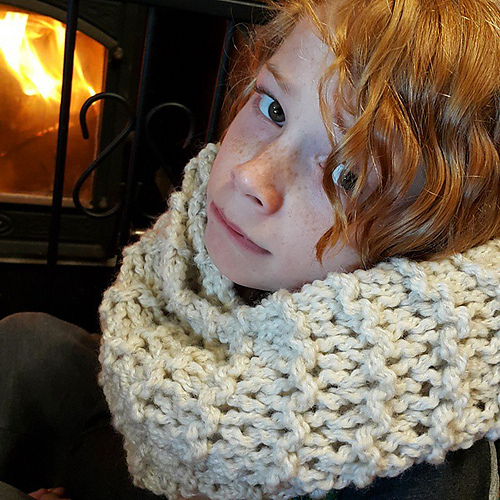 Lighter weights are great for knitted layers, like singlets, and cardigans, whilst medium weights, like DK are great for jackets, longies blankets and sleeping bags. 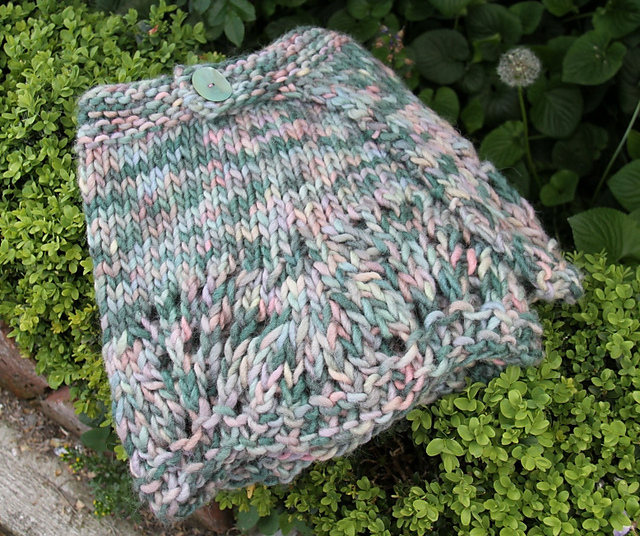 Softer yarns are best for infant skins, so Merino, Polwarth or superwash are great. Tip Three - Wear without Tears. One of the most common questions we get asked is: Will this yarn pill? All yarns will pill if enough friction and movement is applied, so if you are knitting a garment that is going to see a lot of wear and rugged treatment select a yarn with higher twist, stronger fibres and knit to a firm tension. Examples being Skeinz Vintage and Southlander, these are my favourite all purpose wearing yarns. If you are knitting a shawl or cowl, something that won't experience too fraught or friction, then a yarn soft to wear against the skin is perfect. Burlesque or Terabyte are just perfect for these sorts of projects, super, super soft and won't experience too much wear and tear. This fine twist on twist Merino give excellent definition, softness and wear. Natural fibres all have various qualities and some of these reflect in how they act when they are stitched into a final project. 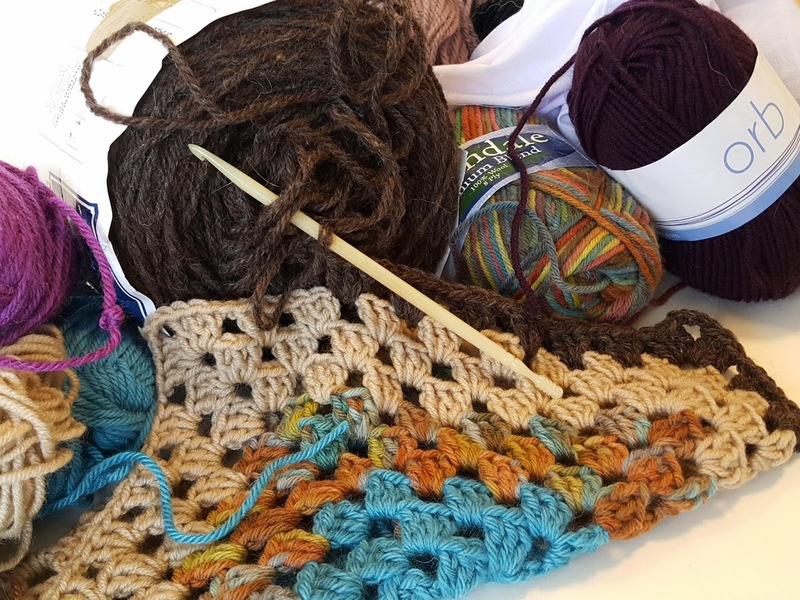 If you are looking to knit a pattern with textured stitches, Aran cables or bobbles you need a yarn that will hold these stitches so they 'pop'. Traditionally these patterns were made with strong wools, which were 'lively' and held their structure when knitted. Wool is still the number one choice for these projects. If you want softness, drape or a floaty fabric, great with lace stitches then fine wool or blends of wool, Alpaca, Silk, Kid Mohair or even plant fibres like cotton or bamboo come into their own. Tip Five - It all comes out in the wash.
Super Wash versus Hand Wash - a raging debate for years to what is better. For me - I hand wash all my yarn garments, regardless of yarn type. I find it quicker, easier and it allows me to reblock/shape a garment more effectively. Super wash has the benefit of being more likely to survive a washing machine accident, it is often a smoother texture as it spun using shrink treated wool fibre and takes colour very well producing vibrant rich shades. Hand wash yarns have a lusciousness that gets lost in the shrinking process of the fibre and a 'grip' in the yarn which makes it perfect for textured stitching, and essential for fair isle projects, especially if they are being steeked. Leaving Sydney Harbour is just such a stunning spectacle. January has evaporated and February is in full swing. The boys are back at school and it seems like only a few days ago we broke for Christmas, time flew with wonderful visits from family and friends over the festive period and then family MacBuscke hit the high seas on our second family cruise. We got dropped off at the door in Napier! Yes it can be done if your ship goes to your home port of call. Cruising is the perfect holiday for us, the mix of great food, entertainment, and so much to do for the kids. So instead of regaling the blow by blow accounts of what we got up to I thought I would give you the MacBuscke Top 5 tips for family cruising. It's not what you are thinking, but what I hear most often when from people who haven't cruised, is the number one reason why is because they get sea sick. This was me. I get dreadful motion sickness, but there are some excellent preparations available for this. I used Scopoderm patches (Must apply BEFORE you set sail) and Sea Legs, both available from your local pharmacy. I took them religiously and also had some prescribed anti nausea in case these failed. We experienced high seas on the Tasman crossing and was not bothered at all. Louis & I shared this cabin - whilst the Tender was blocking a view, there was still heaps of natural light and you could open the doors to get some air. We have had an inside cabin before with four of us and I have to say it was not pleasant. 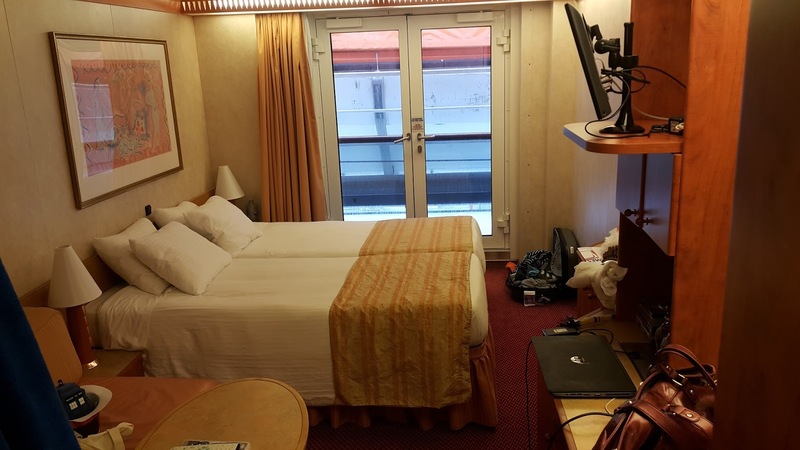 With no natural light it is very claustrophobic and even when you spend a good portion of your time elsewhere on board, you do still spend a lot on time in your cabin. This time we opted for two 'Obstructed View cabins', essentially you pay for the inside cabin price for cabins that are outside in from of the tender boats. These were brilliant. Heaps of natural light, on our ship they had doors that could be opened for fresh air. Hugo enjoying the sites on shore. As I mentioned we had two cabins this time: Louis and I in one and Dr Phil and Hugo in the other. These cabins were side by side. The cost is not double the price as cruise lines charge flat fees for the additional passengers, so all squashing into one cabin can only be marginally cheaper than splitting between two. Make sure you get your agent to price both options out before you book. The boys had a great time - making new friends and enjoying ship life. Dr Phil and I assumed when heading off on our first cruise that we could pack the boys off to Kids Club for good swathes of the day and we would be left to mooch around with our feet up. Big, BIG mistake. Our boys hated the kids club, unless your child is a little darling who will happily partake in pre-school like activities without question, kids club isn't going to be a starter. I also checked out the kids club on this new cruise and there is certainly a 'sameness' about them. My busy boys would not have a bar of this! So this time I came equipped with laptop, movies, drawing utensils and ipads. We allowed the boys to have their own key cards with money pre-loaded to purchase soft drinks if they wished and easy access to the cabins and a surprising amount of freedom. They did us proud, it encouraged them to make new friends on board and they worked very well within the boundaries we set for them. So make your own on board rules with your children, meeting places, cabin access, meal times etc and don't rely on cruise kids club activities. All of this was just $40! It amazes me the number of people to get onto the cruise and rigidly stick to only eating at the venues that are included in their fare. Even if travelling on the tightest of budgets, do set aside a little money to have at least one meal out on a specialty dining restaurant. The meals are heavily subsidized, just a fraction of what you would pay on land. On the last cruise we did the Steak Restaurant and had four courses for just $40 a head & the meal was to die for - even the fussiest eating partner would have found something to wow them on the menu. Most importantly have fun & relax - you are on holiday after all! The Pohutakawa's a in full blossom all about the neighborhood. I love this time of year. The garden looks amazing, roses blooming, lushness wherever you look. The days are longer and you can head to the beach for a quick dip after dinner and the table is overflowing with the fresh season food and fruit that signifies a kiwi Christmas can't be too far away. Hugo and Renly are both quite partial to an after dinner dip. The kids finish school this week - so for me that signifies the start to the Summer holidays. The shopping is all sorted and I am really looking forward to kicking back with the family, catching up with good friends and extended family and even get a good amount of knitting done. Hugo was so buzzed to be able to see the All Black in Wellington. Spring saw us visit good friends in Wellington and it also coincided with the Anzac Exhibition at Te Papa (an absolute 'must see', especially if you have children) and the All Blacks victory parade. 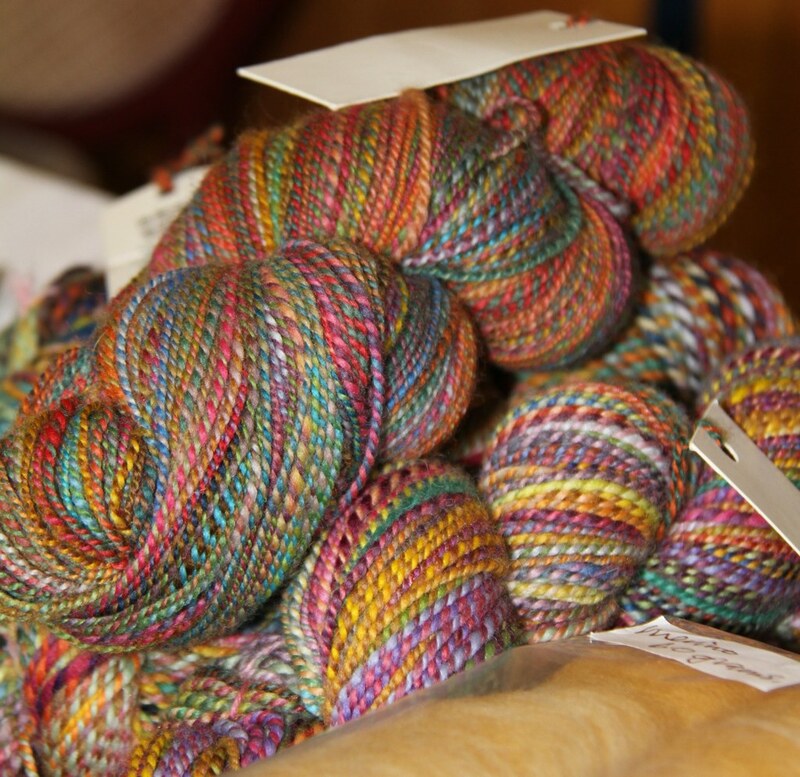 It was a chance to visit the Holland Road Yarn company and indulge in all the yarn goodness that Tash has - bliss. My Doodler, using yarns from my stash, two were spun by us at Design Spun. I have also been mucking around with another MKAL, this tine Stephen West's 'The Doodler'. 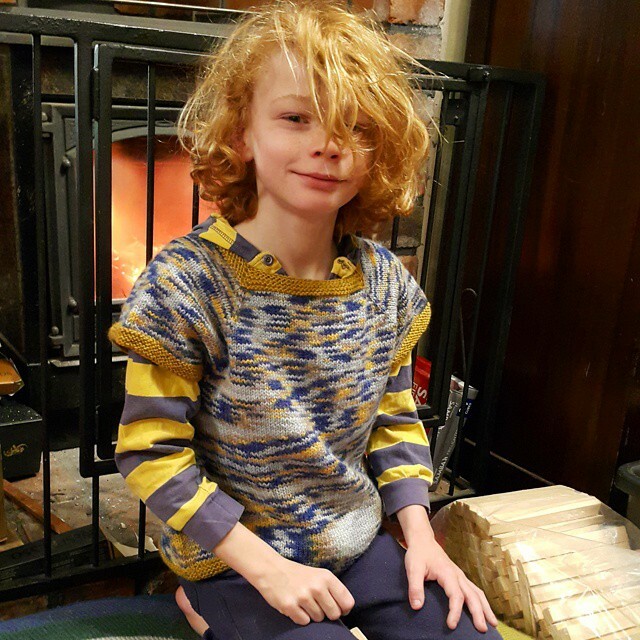 Stephen's patterns are very contemporary, almost avant garde, and the Doodler was a most enjoyable knit. It have excellent structure and shape, but isn't too fussy in it's design. I wore it our for the first time this past weekend and I can see me knitting another of these in the future. So for the first time in ages I have nothing on the needles. I really enjoyed knitting for our friends daughter and am going to do another project for her, an Oriental Lily using some hand dyed silver toned DK with some homespun of mine for contrast. Renly guarding one of the 'stash zones'. But I am yet to discover my 'Summer garment project'. 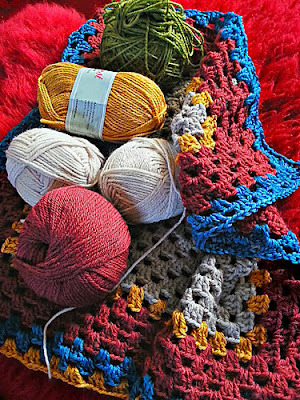 I have the scraps blanket, but I haven't got anything else in the pipeline. I am so torn, do I knit stash yarn or do I knit something from Skeinz yarn that I have been dying to try? Not earth shattering decisions I know, but a decision nonetheless. I am a huge fan of Georgie Hallam's patterns, they fit my shape really well. Louis Loved Holland Rd - they have a knitted Darlek - he thought that was brilliant! KAN is been and gone, Spring has arrived and the entire MacBuscke household is gearing up to year end. It's a planning time at work and a time I start undertaking projects that are more about 'mental holiday' than mental breakdown! The shrug knitted for a friend toddler with the leftovers from my RWC project. When you are a prolific knitter, as I am, the inevitable happens... Leftovers and scraps. Anything from two or three balls from a garment project or half a ball or a wee butterfly of colour surviving after a nail biting round of yardage chicken. It's rare that you don't end up with some scraps after your yarn meal. I recycle the wool scouring bags that arrive at the mill for project and scrap bags. Mine end up in a cotton wool scouring bag, and if I'm honest, there's more than one rolling around my stash cupboard. 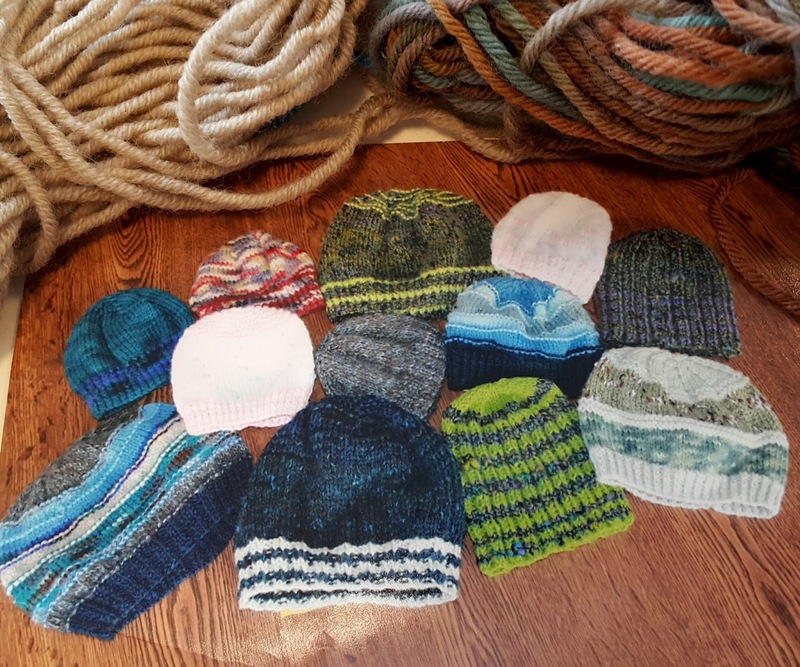 I give a massive amount away, especially the smaller amounts, to my aunt who loves knitting these incredible baby and children's beanies for families of the East Coast, north of my home town of Gisborne. She's knitted hundreds of them and they are so well received. 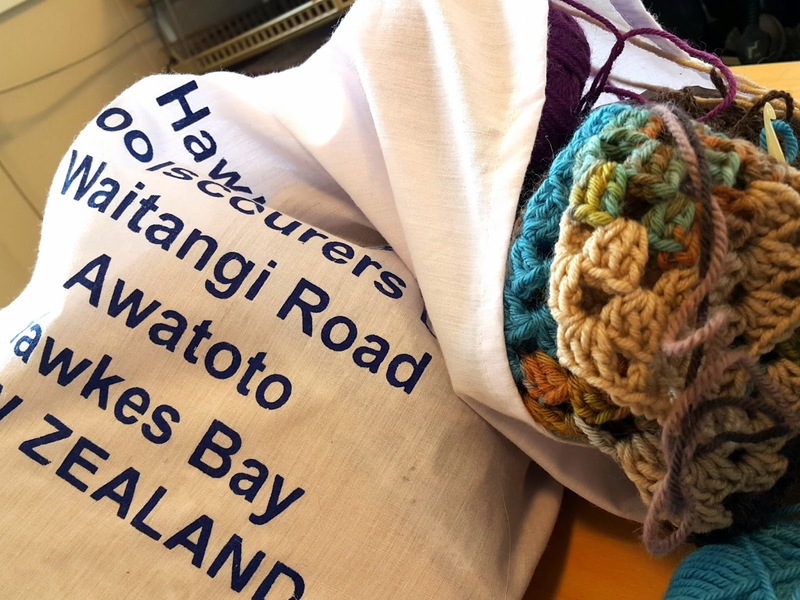 Others knit charity blankets or the classic fish and chip jumpers. Just a small sample of the incredible beanies knitted by my aunt. For me, I decided several years ago to use all those scraps to knit or crochet projects to make our own home comfortable. There is something very homely and special about items made for comfort, made by you, in your home for the pleasure of your family and friends. They grace the backs of our couch, on the couch, on the beds and loved by myself, the boys' and the animals of our home in equal measure. Just a couple of the 'Scrappy' projects from last summer. 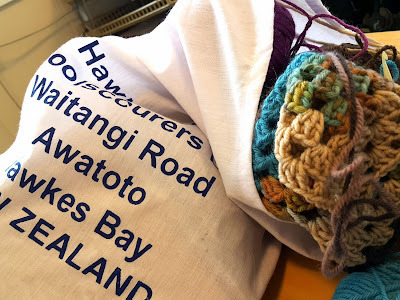 The thought of knitting in a NZ Summer isn't for all, for me the ritual of doing some yarn craft at night is very much part of my evening 'sleep hygiene' routine and during the school holidays, having a project in my bag to whip out at the beach, pool or over the festive break is welcome. Much talk has been around 'mindfullness' like it is something very new or trendy, but as crafters we all know, and have known for generations, that this is so much more than a 'quaint pastime', I am just so pleased that the mainstream have now caught up. Whatever brings you to the yarn craft door, we will always welcome you with open arms, needles, hooks and yarn! This is the blanket from a couple of years ago - it is my son's favourite. 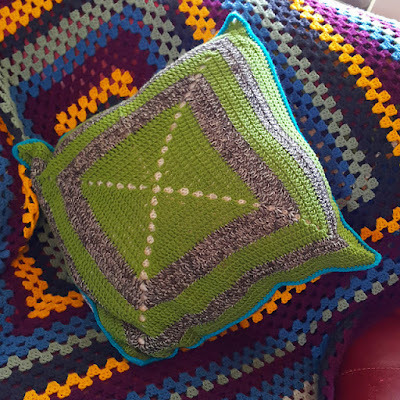 So as the sunshine days become longer and brighter, a cotton bag had been retrieved, a hook dusted off and the beginnings of an organic square design started. This as mindfullness and as long as a glass of chardonnay is attached - I'm happy! One of my first 'scrappy' projects - a log cabin cushion.